Thunderbolt Casino sizzles and sparks and delivers a jolting dose of electrifying fun with their extensive arcade of exhilarating games on offer. Welcoming to international players, but geared towards South African gamers by trading in Rands, makes of Thunderbolt the optimal choice for natives from this country. Also, be sure to take the time to meet up with Thando – Thunderbolt’s seriously groovy chameleon mascot. Thunderbolt Online Casino is committed to ensuring simple and straightforward transactions, while still promising to keep all your financial and personal information secure and uncompromised by incorporating the latest encryption technology in their software. Geared towards the South African market, Thunderbolt trades only in ZAR and makes use of following payment options on their platform: Neteller, EcoPayz, EasyEFT, Visa, MasterCard, Skrill, SID, and Bitcoin, with all funds being instantly deposited to your account. Cash outs can be made through all of the above mentioned banking options, with the exception of MasterCard, with minimum withdrawal amounts differing from one method to the next, and withdrawal times usually occurring in a time-frame of between 48-72 hours. Thunderbolt Casino welcomes new players to their establishment in a loud and blazing fashion by offering them a substantial bonus spread over the first four deposits made, as set out below. Your first deposit will be matched 100% up to R2500 – coupon code FLASHMATCH1. Second deposit is matched 125% up to R2500 – coupon code FLASHMATCH2. The 3rd deposit will be matched 150% up to R2500 – coupon code FLASHMATCH 3. No deposit bonus - receive R2500 for free after claiming the first three deposit bonuses – coupon code ULTIMATEFLASH. The first three bonuses are subject to a 30x playthrough requirement of the bonus and deposit, and the no deposit bonus has a 60x playthrough stipulation. Thunderbolt Casino automatically enrolls every new player at their casino into their comp point system, which works by allocating you 1 point for every R10 bet placed. Every 100 points are then redeemable at any time at the cashier for R1. The Game of the Month promotion offers you the chance to earn double points for every R10 bet, so be sure to keep an eye on your e-mails to learn which game is relevant to earning you these extra points. Also on offer is a daily 25% cashback promotion for any no bonus deposit. If your account balance in between 0 and R25 and you make a deposit, you can contact customer support to receive 25% of your deposited amount credited to your account. This promotion is subject to a 10x rollover requirement with Scratch Cards, Slots, Keno and Bongo contributing to these conditions. The casino has a multitude of additional promotions on offer including BigThunder Bonus, Facebook bonus, First Spins, Happy Hour, Midweek Spins, Monday Bonus, Monthly Boost, VIP special, Weekend Bonus, and You Found It. Feel free to check out their site for in-depth descriptions and details of each. Thunderbolt Casino incorporates 128-bit encryption technology on their portal, ensuring the ultimate and crucial protection of your personal data and financial information. They also include the use of Random number generators (RNG) on their platform to guarantee the absolute fairness and impartiality of all games available in their arcade. The casino’s website features a simplistic yet modern design done mainly in differing shades of blue. The landing page showcases a roll-down menu linking you to various relevant pages, like: creating your account, all the promotions on offer, etc. In our opinion, this site is uncomplicated, extremely user-friendly, and easy to navigate. Thunderbolt offers three modes of site access and play – through their software download, via instant play, or on your mobile device. The software is downloadable from the website itself, but it’s far simpler to just gain entry directly to the portal for the instant flash play version through your browser. The Thunderbolt mobile casino is just as convenient for when you are on the move and don’t have your personal computer at your disposal. Log into the platform through your device search engine and enjoy all available features in miniature. Thunderbolt’s game library is powered by RealTime Gaming, a leader in the design of casino machines, and features a portfolio rich in attention-grabbing, graphically superior games. A big hit on the platform is the popular Real-series video slots, showcasing detailed themes and numerous progressive jackpots. Playing games other than slots is equally exciting with modern graphics specifically designed to better emulate land-based casino games, and gamers can place wagers at their own pace and make a bet based on their individual requirements and how much cash they are willing to chance. The more than 200 titles available at Thunderbolt are conveniently categorized under prominent tabs on the game page, making it a little easier to navigate through all the titles and to pick one that suits your fancy. Most of the titles available fall under the Slots category and there is a multitude of names to choose from, like: Gemtopia, Caesar’s Empire, Fruit Frenzy, and Ghost Ship; with the Progressive slots offering up Aztec’s Millions, Cleopatra’s Gold, Megasaur, and Spirit of the Inca. Heading over the Table Games section will have you choosing from Pai Gow Poker, Tri Card Poker, European Blackjack, Pontoon, and Baccarat. The Video Poker category offers up titles like Sevens Wild, Bonus Poker, All American Poker, Aces and Eights, and Jacks or Better. Under the specialty selection, you’ll find Lucky 8’s, European Roulette, Craps, and Treasure Tree on the menu. Highly qualified and dedicated representatives are available 24/7, all year round, to attend to any problems that you might encounter or any queries you may have. You can get in touch with Thunderbolt’s customer support by telephone on 0-800-980-320 or by sending off your question via email to [email protected] Alternatively, get an instant reply through the Live Chat option available on their website. There is also a comprehensive FAQ section available on the site if you would like to have a peek to see if your question features there. Thunderbolt Online Casino has not been in operation for a very long time, but in the relatively short period that they have been conducting business they seem to have ironed out many of the common industry problems common to the industry and made a thriving and successful wagering establishment that caters primarily to South African gamers. They run a secure and trustworthy platform on which all banking transactions and personal information is kept safe through the incorporation of the latest 128-bit encryption technology, and offer and variety of dependable banking options geared to the South African client. Their gaming arcade is rich and stock full of thrills and entertainment – you can’t expect much less from RealTime Gaming, an industry leader in gaming design and software; and offer a flexible choice of three playing modes by presenting downloadable software, instant or mobile play. Their website itself is designed with the everyday player in mind and is incredibly user-friendly with all relevant information on hand for easy access. Thunderbolt Online Casino has most certainly exceeded all our expectations, and we are more than happy to give them a star rating on our list of recommended online casinos for South African players. Go on, hurry and be quick, sign up for your account and we can guarantee you’re in for a booming good time! Does Thunderbolt have a mobile app? 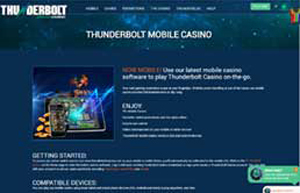 Thunderbolt does indeed feature a vibrant mobile casino for our on-the-move gamers. You can access the gaming platform directly through your smartphone or tablet browser, and it’s compatible with most iOS and Android devices. How do I get in contact with customer support? Friendly and knowledgeable representatives are on hand 24/7, 365 days a year to attend to your questions and can be reached on 0-800-980-320, [email protected], or Live Chat. Is ThunderboltCasino.com safe to play on? Thunderbolt is as secure as they come, with being licensed through the Curacao eGaming Regulator, featuring the most up-to-date 128-bit encryption technology to safeguard your banking and personal details, as well as using Random Number Generators to ensure all games are fair and impartial.